It’s September on the wet coast and with that comes the first fall storms and their accompanying rains. 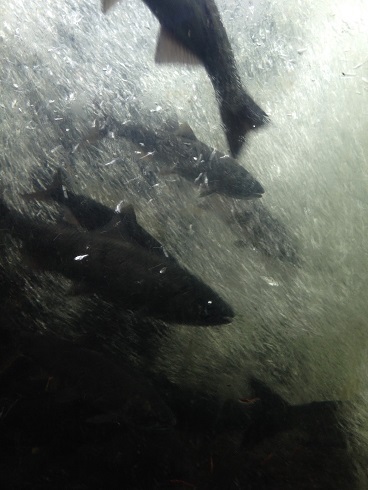 While this may seem like a perfect time for most wildlife (including people) to slow down, it is a time of frenzied excitement for salmon migrating inland from the ocean. While most of us enjoy summer’s warm, dry, lazy days, those conditions reduce the streams that salmon spawn in (like Beaver Creek) to nothing more than a trickle. These low flow conditions make it impossible for fish to move upstream to their spawning gravel to complete their lifecycle. However, as the autumn rains fall, the streams begin to fill, rising and cresting over their dry summer banks. Eventually the water flows downstream to the ocean where the salmon have been patiently waiting at the mouths of rivers, streams and creeks for the signal to continue on their one-way journey. So when you’re looking outside at the rain falling, feeling like the best months of the year have passed, channel your inner salmon and feel the excitement that the change in season brings. Put on your rain jacket and gumboots, explore your local stream, walk its banks and see if you can spot the salmon leaping with joy as they migrate upstream to complete one of the most amazing natural migrations in the world. To learn more about SPES’ project Restoring Access for Salmonids to Beaver Creek, click here.